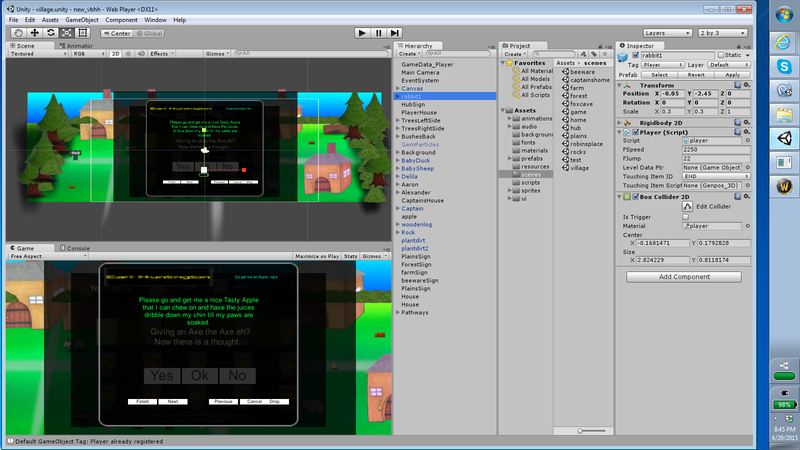 We have a number of guys at work interested in using Unity and a couple that are using it for work purposes. So it came about that we are going to have a little meet up 1 lunch time per week to talk about issues and suggestions and show off what we have been working on etc. Currently the club does not have any formal idea of what it is about except that Unity is the main part of it. So today I kicked off the club by talking about Unity3D and what I think are it's pros and cons. I used my Very Bunny HaHa game that I am working on as my example and started talking. I never stopped except for air for 40 minutes... YeeOuch! I think everyone was entertained and informed by all the areas I talked about, and showed them within Unity itself. I am still a bit shell shocked that I talked for that long about it, but at least the major introduction is now out of the way. Next weeks meeting should include the other guys talking about their stuff, or I sure hope so anyways. Good time to be honest. More to come in a future post. Suffice it to say I have finally gotten back access to my Blog page. Woot!